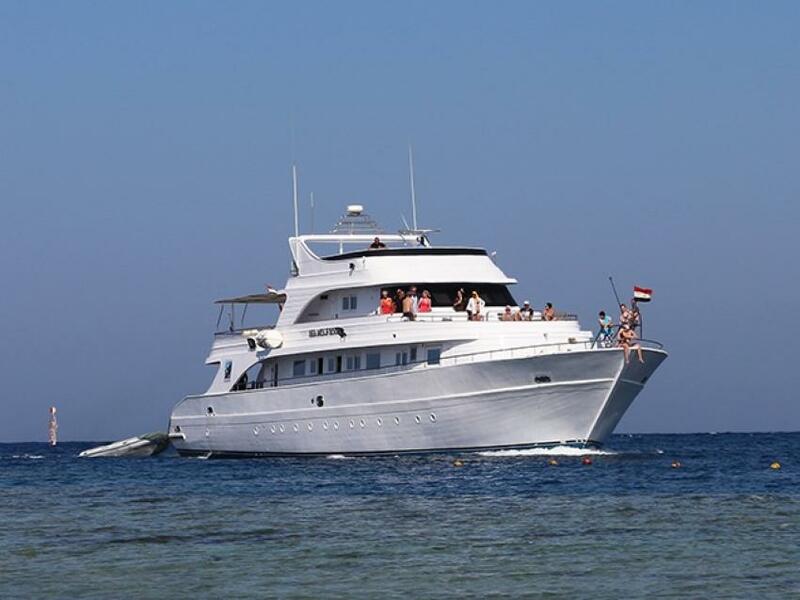 Seawolf Soul - 36 meters modern yacht, part of Seawolf Safari Fleet, that offer safari on the Red Sea. Seawolf Soul Liveaboard can welcome 22 passengers. Eight rooms placed on a lower deck, two on the main deck and one cabin in on the upper deck. All cabins are spacious, has air conditioning and minibars. Seawolf Soul has several relaxation zones. Boats guests can spend time in between dives in the air-conditioned salon, watch TV or DVD. Another comfortable zone to relax is sun deck. It has big shaded part with sofas and open air part with several cushioned sunbeds. It is perfect to enjoy the view of Red Sea. Spacious dive deck of Seawolf Soul Liveaboard equipped with numerous of storage boxes. It is comfortable for preparation for the dive. Divers, who have EANx certification can use Nitrox on board, boat supplied with Nitrox membrane. Safety is one of the important things during the safari. To ensure that you would be safe boat equipped with rescue equipment ENOS, 2 emergency rafts for 20 person each, life jackets, medic first aid kit, oxygen. Seawolf Soul can offer various itineraries for divers. Boats passengers can dive at Brothers Islands, between colorful coral formations. This destination is a true paradise for marine photographers. Pictures made here are truly amazing. Divers can also discover the wreck of Red Sea, known all over the world, see trucks on a board of Thistlegorm, visit Abu Nuhas ship cemetery, Birchwood II, and SS Turkia. Divers can explore from the inside some of this ships. Southern destinations, like St. jones suites for night dives. Plus hammerheads are often guests of this area. Diving conditions of Egypt is always good for diving, although in winter water temperature can be cold. May to October can consider as the high season for diving in the Red Sea.